Saint Nicholas or Santa Claus??? 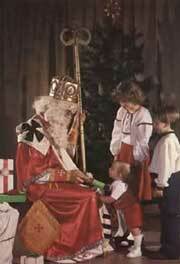 Saint Nicholas, was the “gift giver” I was familiar with during my childhood. He had a white beard, was dressed in bishop’s garbs, carried a crozier, and arrived on a white horse. On December 6th, he was visiting well-behaved children, and placing candy and cookies under their pillows. If you were really good, then he would drop off more goodies on Christmas Eve. You also were expected to know your Catechism, in case he decided to quiz you, before leaving you a gift. We recited prayers and songs dedicated to St. Nicholas, instead of leaving him milk and cookies.